Welcome to the Twenty Fifth Edition of the Owen Guns Bulletin. 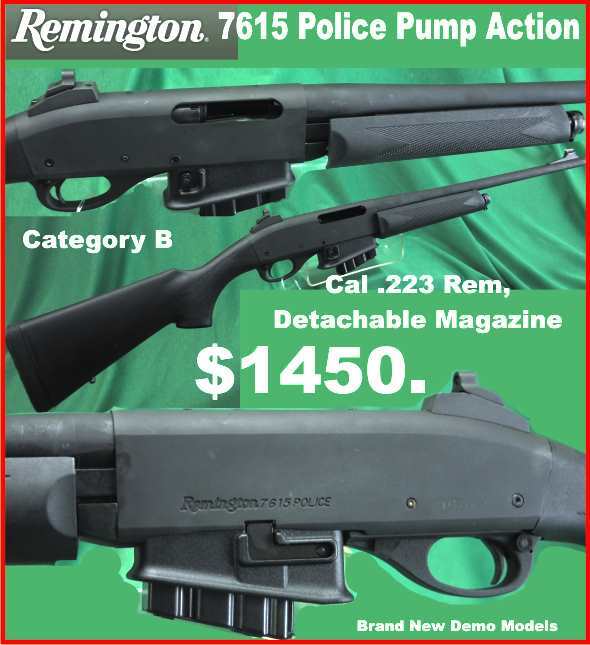 Remington Pump Action Police Model 7515 in .233 rem with detachable magazine. 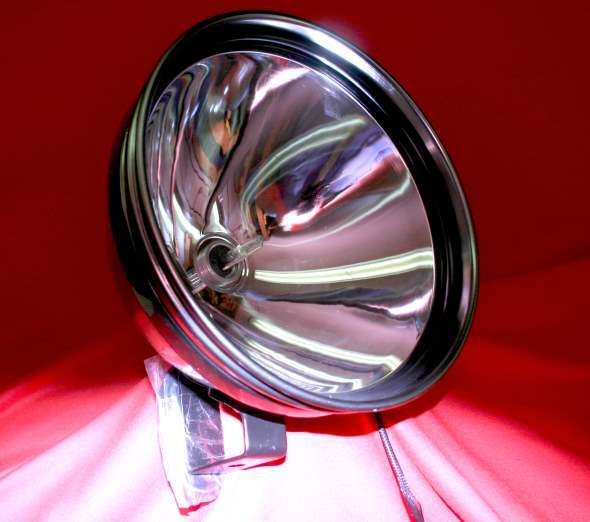 These HID, High Intensity Discharge Lamps produce on average 4.5 times the light of ordinary spotlights, it uses only 3.0amps, compared to a standard 100w halogen which uses approx. 8amps and the bulb should last 5 times longer than the a halogen bulb. Jon Benzen Tools a Div of Chicago Tools make these stainless hollow ground hunting knives, they are crafted of the finest material and precision machined to provide the maximum accuracy and work life. They are manufactured in accordance with US. Federal and ANSI specifications. They include a leather belt sheaf. The best knife value ever. The tip-up shotgun action is a development from the double barrelled muzzle loading shotgun. A steel frame or receiver replaces that portion of the wood muzzle loading stock from a point about three inches forward of the breech of the barrels to a point about two inches in rear of the breech. The barrels are hinged to the forward end of this frame, the muzzle dropping down and the breech rising to load. As generally made for a double barrelled gun the barrels are secured in firing position to the frame by one or two lugs on the underside of the barrels locking into the frame, and often by an extension rib on top of the barrels locking into the top of the frame. With a well constructed gun it is probably necessary to lock or bolt the barrels to the frame at only one of these places, and where both are used in the same gun it is usually to increase sales rather than to assure safety. Actions were first made with outside hammers and locks as on muzzle loading guns, but practically all double barrelled guns are now made hammerless. Two types of locks, that is the firing mechanisms, are in vogue. The Dickinson & Son side by side 12 gauge is a good example of the sidelock design and the locking lugs under the barrel are partly visible. The box lock or Anson and Deely lock, has the firing mechanism enclosed in the frame or receiver. The side lock has the firing mechanism applied to the sides of the frame as on a muzzle loading or hammer gun. American manufacturers usually prefer the box lock, while British gunmakers are about equally divided in their preference between the two types. A careful analysis shows that the frame can be made slightly stronger when the side locks are used, but the choice between the two types has lost its importance in recent years because with modern alloy steel and proper heat treatment either type of lock has an ample safety margin. 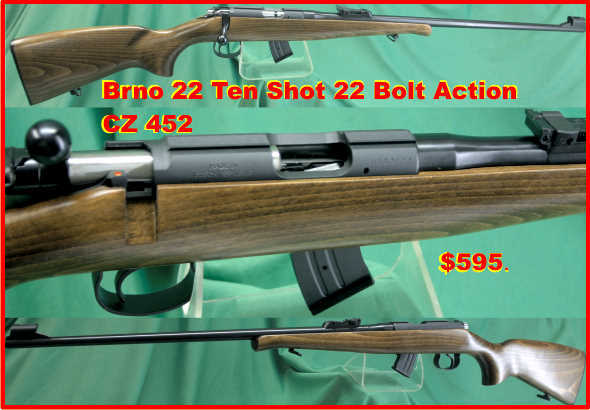 This Krupp side by side 12 gauge is a good example of the Box lock and with both upper and lower locking systems. About fifty years ago the Winchester Repeating Arms Company instituted a new procedure in fabrication by which they secured the two barrels to each other without the application of heat (and solder) which would nullify the heat treatment of the barrels, and they also applied a very modern steel and heat treatment for all parts. Such guns have been tested by firing 2,000 rounds of high pressure proof shells in a single gun without developing a particle of looseness in the hinge or between standing breech and barrels. When this test was conducted it was found that the firing of ten such proof loads would develop some looseness in practically every shotgun made previously even in the most expensive European guns. The tip-up of break action shotgun and double rifle action will probably continue in manufacture and popularity indefinitely. 1. When it is ready to be drawn and fired it is safe to carry and all of the parts are free from spring tension, semi auto hand guns have many parts, such as magazine springs under tension this decreases reliability factors. 2. Besides the double rifle and shotgun which has two separate firearms joined into one which is the most reliable repeating system the second most reliable is in the revolver if a round fails to fire, the mechanical action of the trigger presents another fresh chamber with another round with which you can save your life. A semi auto or a full auto requires a clearance procedure to be carried out before the firearm is ready to operate again when a round fails to fire. This could be terminal. Its drawbacks as we now see them are the difficulty of manufacture with strict interchangeability of parts, inability to disassembly and assemble by hand alone with all parts, and the shifting of the hand grip to manually operate the weapon. The latter drawback greatly increases the amount of training necessary to develop skill in really accurate rapid fire. As the author reviews all the small arms actions known to him, the above are really the outstanding ones. The list does not include all good actions but it includes those that have proved superior enough to have had very long periods of manufacture and satisfactory use, or those that might seem to have an extended future life. 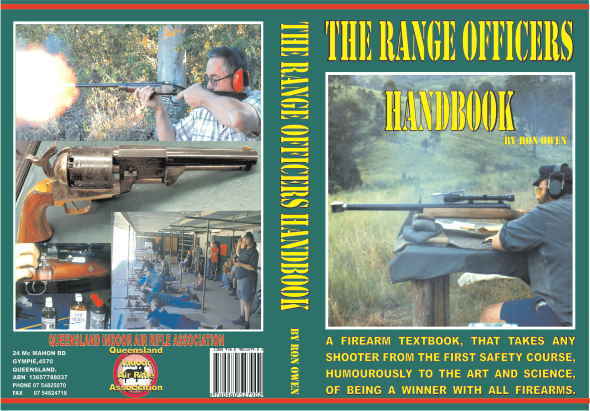 The above list does not include semi- auto or fully auto actions they will have to wait for a separate book. For years Europeans have been quite content with the tip-up action for both shotguns and rifles, and repeating actions were developed almost exclusively on the bolt action for both military and sporting purposes, culminating in the final development of the superior Mauser 1898 action. General Principles of Breech Action Design. A manually operated breech action for a small arm should include the following features. 1. Proper and safe support for the cartridge to be used, including proof cartridges with a 25 percent overload. Safety and durability involve both design and materials. 2. Efficient mechanical operation, including sure functioning under service conditions. Positive insertion and extraction of loaded cartridges and fired cases, with ample power to accomplish this under all probable conditions of use. 3.Proper mechanism for indenting primers. 5. Easy and fast operation. 6. 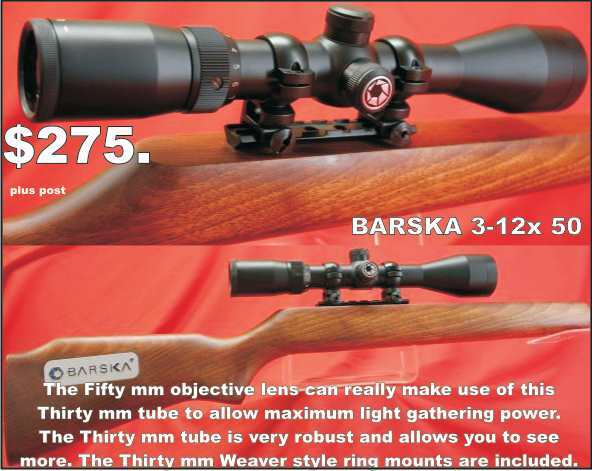 Design adaptable to modern marksmanship methods. 7 If the above details are incorporated the safety factor is assured. Expanding on each of these features in turn. Breech Support. In all manually operated single shot and repeating breech actions the breech block or bolt, or the standing portion of the receiver breech, must support the head of the cartridge solidly against the pressure of discharge. Under the high pressure of burning powder gases there must be some elasticity and “give” to the materials, which in time will result in a permanent set-back. This elasticity should be as small as possible, and in the case of high intensity cartridges it is essential for safety and durability that we reduce it to a minimum by employing proper design and materials. The designs which result in minimum elasticity and set back are those in which the breech block or bolt is uniformly supported close to the head of the cartridge, therefore that rather restricts the design of the breech action to certain types, in general it may be said to the bolt action and the falling block action. 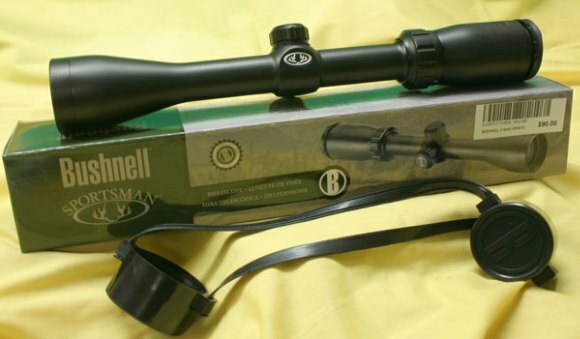 The Remington Model 14 and half is chambered to fire a medium capacity cartridge such as the 44-40 Winchester. When the breech pressure of the cartridge is not so high certain liberties may be taken, not perhaps as to solidity of support, but rather as to its uniformity and distance from the head of the cartridge, and this gives the designer more latitude. Thus when pressures do not exceed about 42,000 pounds per square inch we may lock the breech block at a point several inches from the head of the cartridge, as in leaver actions, and in some cases we may support it by only one locking lug on one side of the block instead of using two lugs to uniformly support it. When the conventional cartridge or shell is discharged in a normal and properly made chamber a sudden pressure of gases occur which quickly reach a peak of about 10,,000 to 50.,000 pounds per square inch, depending on the characteristics and loading of the cartridge or shell. The back thrust on the breech block or bolt thus depends upon the area in square inches of the head of the cartridge case. The friction between the walls of the chamber and the body of the case also’ enter into the problem but we will disregard these for the moment. The head of the .30-06 case, for example, is approximately .470 of an inch in diameter and thus has an area of .1735 square inch. (To find the area of the a circle, as the head of a case, square the diameter and multiply by .7854) If the breech pressure is 50,000 pounds per square inch then the back thrust on the head of the bolt will be 8,674 pounds per square inch. Such a back thrust requires a bolt solidly and uniformly supported close to the head of the case. On the other hand the head of the rimmed .30-30 cartridge measures approximately .50-inch, and this cartridge is usually loaded to a pressure of about 38,000 pounds, so that the back thrust on the block is about 7,461 pounds, and we can take more liberty in the design of our action and lock the bolt several inches from the head of the case. Breech pressure alone is not a safe guide to the strength of action required. 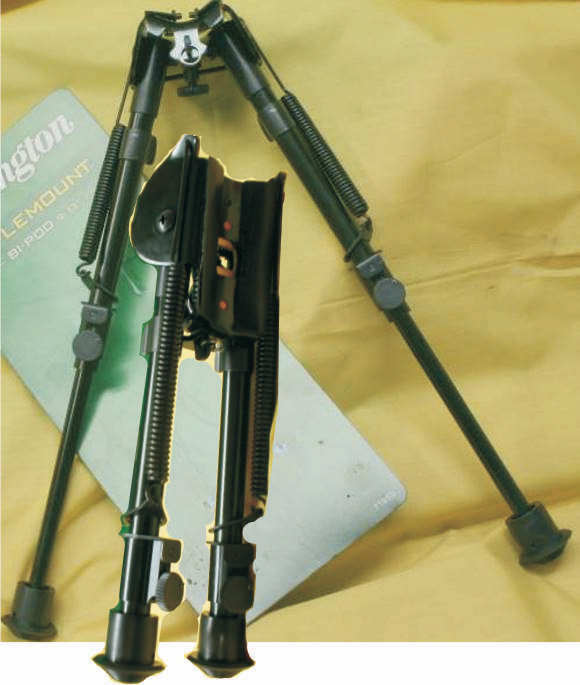 The little .222 Rem cartridge, for example, is frequently loaded to a pressure close to 50,000 pounds, but the diameter of the head of the case is only .37 inch, and the maximum back thrust only about 5,300 pounds, so that a design with less locking strength can be designed than what is needed for the .30-06 or .308 win cartridges. Next Edition More on Action Design. A thick-walled case has less volume and therefore less space for the powder charge than a case with thin walls. During ignition /firing it is the chamber that controls the external profile and dimensions of the case, a thicker case will still provide less room for the powder to burn and work than one with thin walls. Extensive tests conducted by various individuals have shown clearly that the volumes of different brands/ makes and lots of cases in the same calibre can easily run to as much as 5 per cent or even occasionally more. Reduce the space in which a specific powder charge has to work by that much and you have increased the loading density and the chamber pressure that will be produced. Generally speaking, the amount of increase produced by the volume variations encountered in commercial cases will not produce excessive pressures, even with full-charge loads, unless other factors interfere. However, when one is working with cases reformed from some other calibre, much greater volume variations will be encountered. For example, it is fairly common practice to reform 7.62mm NATO military cases to .22/250 calibre. A case so formed may well have a volume as much as 10 per cent less than its commercially-produced counterpart. Consequently, a full-charge load developed in the commercial case can produce as much as 10,000 psi rise in chamber pressure when fired in the altered military case. 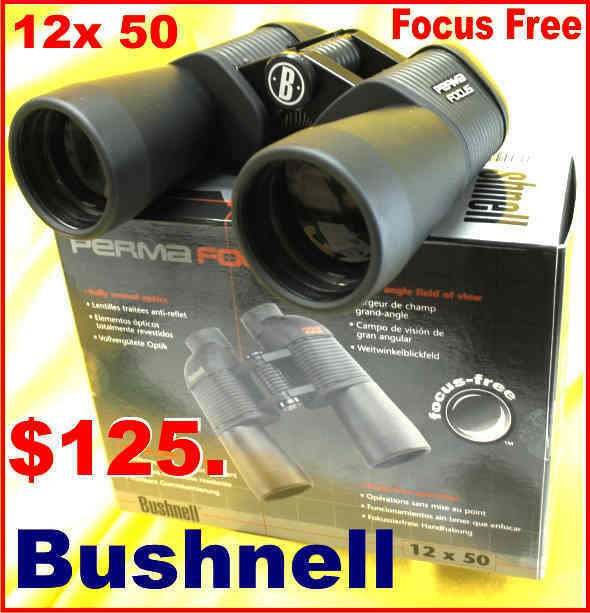 All this is brought about simply by the fact that the military case is designed with walls and head substantially thicker than the .22/250; and that the swaging down of this case to smaller dimensions increases wall thickness even further. The result is a case that may appear identical externally, but has considerably less volume. This factor must always be considered when using military cases or any cases that have been extensively reformed or reworked. A given charge of powder will produce greater pressure when rapidly ignited throughout by a large, hot primer flash than when sparked by a relatively weak flame. A full-charge load developed with one particular make and model of primer will increase in pressure if a “hotter” primer is substituted. Consequently, if one were to substitute rifle primers — with more priming compound content — for pistol primers in a heavy .357 Magnum load, chamber pressure would be increased. Conversely, substituting a less-hot or “cooler” primer will produce a reduction in pressure. Again, generally speaking, the effect of primer substitution upon pressure is relatively slight, but measurable. This is covered in greater detail in the chapter devoted to primers. A difference is firing pin energy can effect the pressure develped and cause pressures to exceed with the wrong load. A weak firing-pin blow produces slow and erratic (relatively) ignition of the priming compound and this in turn results in less efficient and less complete ignition of the powder charge. In this manner poor primer ignition brought about by a weak firing-pin blow causes poor powder charge ignition and lower chamber pressure. At the other end of the scale, a very heavy firing-pin blow has just the opposite effect. The difference is relatively small, but it does exist, and is particularly encountered in revolvers where alterations have been to the mainsprings and firing-pins; and also in self-loading pistols with very light weight inertia-type firing-pins. As mentioned above, the actual volume within which the powder must burn is dependent upon case volume; and case volume is dependent upon the external dimensions of the case at the instant of firing and those values are controlled by the chamber. A tight chamber has the effect of reducing case volume and consequently increasing loading density and chamber pressure. All other factors being equal, a tight chamber will produce greater pressure than a sloppy, loose one. The leade or lack of free travel can cause an increaase in chamber pressure. 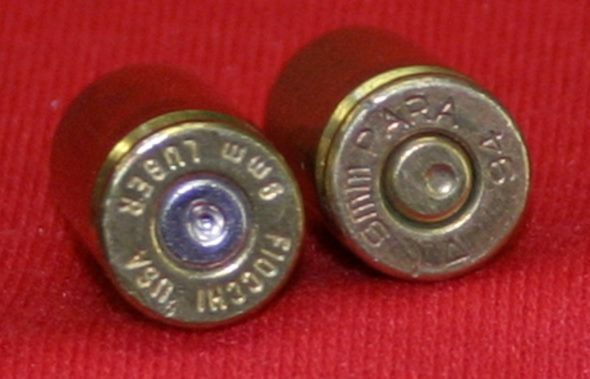 In modern practice, the bullet is permitted a modest amount of free travel within which it picks up velocity and momentum before engaging the rifling. This initial unrestricted movement allows powder gases to begin expanding early and thus eases somewhat the pressure peak. This amount of free travel is generally established by the rifle manufacturer based upon the longest and bluntest bullet which will be loaded in a given calibre. Consequently, the amount of free travel does not remain constant for other loads and other bullets. Shorter or more sharply pointed bullets will travel farther before engaging the rifling. 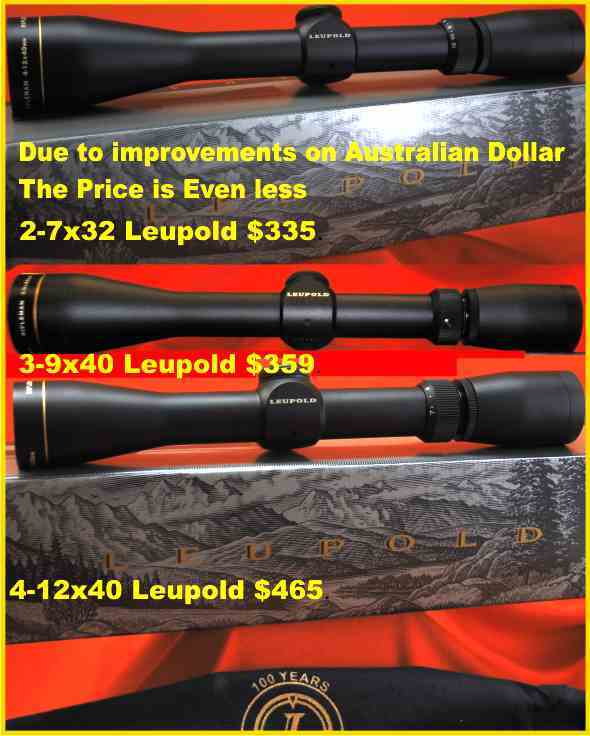 All other factors being equal, the greater the distance the bullet travels before engaging the rifling, the lower pressures will be. Many wildcatters and some foreign gun manufacturers deliberately “free-bore” barrels for a substantial distance for the sole purpose of holding peak pressures down and allowing maximum velocity to be obtained. The term “free-bore” is usually applied whenever excessive bullet travel is involved before engaging the rifling. However, inasmuch as there is no standard distance the bullet of any given calibre must travel, this is a rather ambiguous term. 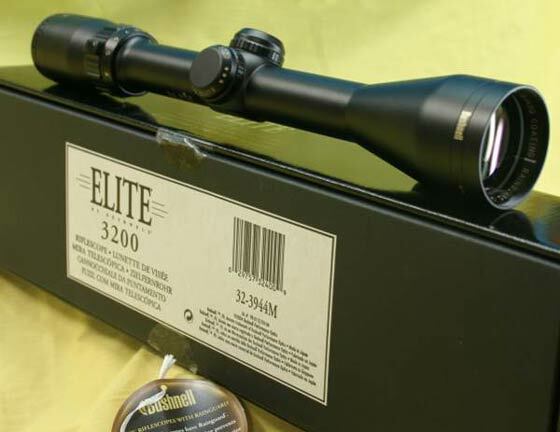 In addition to the leade profile furnished by the manufacturer, one must consider that the throat is advanced by extensive shooting with modern high-intensity cartridges. 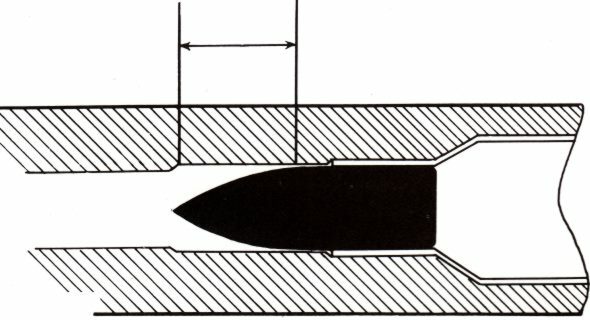 The origin of the rifling is simply eroded away to the point where it substantially increases the distance the bullets must travel before engagement. Consequently, a given load will produce a particular pressure when fired in a new barrel, but after, say, one or two thousand rounds have been fired in that same barrel, less pressure will be produced. 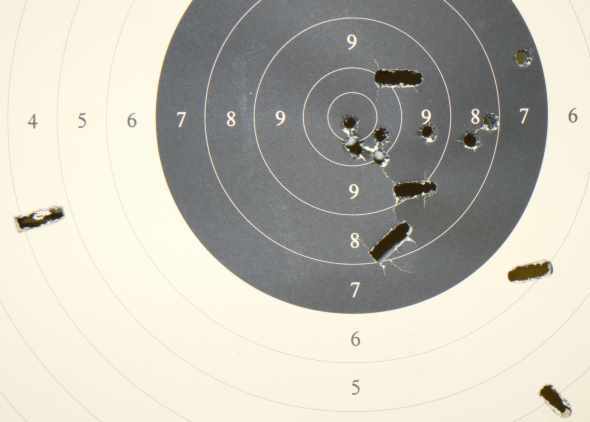 It is the practice of some meticulous shooters to compensate for erosion by simply seating the bullet farther out of the case as erosion progresses in order to maintain a standard amount of free travel. However, to retain exactly the same performance, the powder charge must also be increased to maintain a standard loading density. A change of internal pressure can effect the result, such as these bullets that have lost stability and gone through the target side ways. All of which is fine to know, of course, but how does the casual handloader learn whether a particular load and set of conditions is producing safe or excessive pressures? Short of a pressure-measuring laboratory setup which is not generally available there is no method by which the individual can determine the amount of pressure being produced. There are, however, visible symptoms of pressure that are in excess of what the particular gun/load/component combination can handle. Sorry again if you were the unlucky ones to get 20 copies of the free Bullet calculator or 50 copies of the fortnightly free operators manual. Hopefully it is fixed now I have changed from Windows Explorer to Windows Live. It seems that every time I send a large amount of large electronic files it would keep resending and not clear the Outbox. Over work killed Windows Explorer. The free Bullet Calculator is a 3 meg program and I have sent them out to over 1200 readers this could have been part of the problem so now on request from your emails they will be downloaded to you by another source, so no more 50 copies in it in your in box. If anyone has requested a Bullet Calculator or Operators Manual and not received it, or not had an answer to their email orders, please send again as it should all be working again as of Monday the 14th September 2009. Don't get caught letting a tiny one off in your back garden. There is a law for the government and different laws for the slaves like us. In the old Roman days they knew the best way to get re-elected was to supply free ‘Cakes and Games’, they never cared about the gladiators who died in the cause of entertainment. Of course in the 21st Century we don’t have to queue for hours to get into a hot dusty amphitheatre and suffer the smells of blood and guts, all we have to do in the comfort of our lounge is to press the buttons and instantly you can watch the World Trade Centre implode, 3000 people killed in minutes, what’s more they will replay it from 400 different angles for hours. Flick a button and its on another channel going down again. They couldn’t do this 2000 years ago but the motives were the same, it takes the peoples mind off the price of fuel and food. The Roman Games did not stop for Christianity, entertainment had a priority over religion, even at the fall of Rome when Alaric Visigoths besieged Rome the people were starving to death ‘but the show must go on’ the Gladiators fought to the death and the Roman citizens fought to take the bodies home, as cannibalism meant life. The Visigoths burnt, raped and murdered Rome in 410 AD maybe they deserved it? Nothing changes, the State of Queensland is bankrupt, Motor Registration is $800, petrol is $6.50 per gallon but Captain Anna Bligh buys your vote with ‘RiverFire’ a firework extravaganza of Gi normous proportions millions of dollars worth of fireworks, physically burning tons of explosives to entertain the plebeian masses of Brisbane. Of course the millions of people of Brisbane deserve to get something back for their taxes, they won’t get anything else. The people of Brisbane are the Queensland kingmakers, as the inner suburb electorates decide who governs Queensland. As they use the trains and buses which are extinct in the rest of the State they may be immune from the price of fuel and motor registration or they would not clap so hard when Anna Bligh appeared. 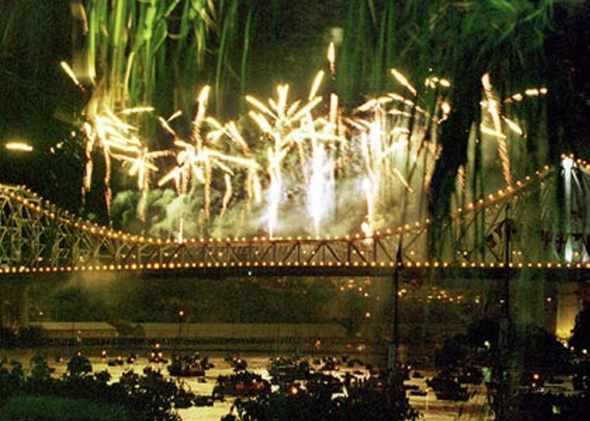 No one in the audience would think that it was immoral that tons of black powder could be exploded in the centre of Brisbane population, yet anyone of those millions of spectators would be judged a Terrorist if they were caught letting of a ‘Roman Candle’ firework on their barbecue plate in the middle of a 50 acre property in the suburbs. We know there is no Justice, but there is no attempt to make the lack of it equal. We have Anti Discrimination laws that do nothing else but discriminate between people, they just reverse the polarity, and protect the guilty against the innocent. Speak out, about immorality and your prosecuted while the immoral are protected. Apparently I am the most charged person in Australia, who has had no convictions yet. Well I might have moral convictions but no convictions from a Judge. 2500 approx, its hard to keep count. Some of my earliest charges from the 1990s concerned 640 charges against the Film and Literature Act. Lock Stock and Barrel a magazine I wrote for, had printed in an article by Guy Fawkes, the 800 years old recipe for Black Powder (Gun Powder) nothing elaborate on how to do it, just a list of three basic ingredients and the proportions the Censorship board classified the magazines as prohibited. I was found with 640 copies in my possession they confiscated them and I received the charged in the mail. The fact that every good encyclopaedia or Science text book in the country has much more information on the subject was no defence, the government banned them I had them if I had them it was proven. My only defence was to try and show that the law was wrong. Four years of unsuccessful litigation but fortunately no convictions. Those laws are still in place, but my eyes nearly popped out last week as there on the idiot Goggle box it did not just list the ingredients but showed any budding terrorist how to blow up a commercial airliner. Of course television channels are immune from the law. The findings at the trial of the Liquid Bombers who intended to blow up 18 planes with 18 suicide bombers were televised last week , they showed video of the bombers purchasing the Hydrogen …………. and how to mix it (disguised in Lucozade bottles) with Ammonia ……………… and detonate it with the batteries from their ipods. Then they showed an expert using the same formula and detonating method blowing the side of a plane out. So are we all going to run down to the chemist supplies and tell them we need some Hydrogen ……….. to die your hair with and mix it with the draino. I doubt it. Will they follow the idiocy of banning guns and ban both of these products, or ban ipods, they might as well ban Lucozade for the amount of good it would do. This shows that banning guns from law abiding citizens is only a power play of politicians as, 5000 could have been killed in the airline explosions, 3000 plus were killed not by Muslims but by the box cutters, have they banned box cutter? 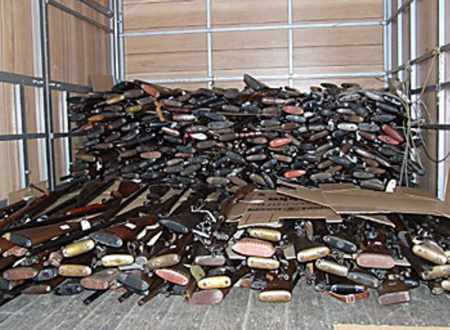 We have had enough buy back and confiscations, sights like this should never happend again. Even if these Islamic misfits do not kill us they steal our freedoms. Or are they just used by our untrustworthy politicians for creating a reason to disarm the people. Either way we suffer for there insanity. Will they ever do anything to stop Muslim Terrorists? These were British Muslims, at Mumbi they were Pakistani Muslims, at 911 they were supposed to be Afghan Muslims it seems an in disputable fact that international Muslims have declared war on the rest of the world. The rest of the world must defend itself even though the people can never really defend itself against its own governments. In the same way that the rare passive Muslims cannot defend themselves against the suicidal maniacs who run their counties. They at least have a right to defend themselves a right which has been removed from ourselves. Unfortunately we have to be judges as Australians or British or Americans and any time we want to change the operations of those countries it is our responsibility to change it or we suffer the consequences of what they do. So to must Muslims. I like most people have met some very nice Muslims, some whose moral convictions have been a lot stronger than most Christians I know but the time has come when the gloves have got to come off. They have declared war on all races and all religions other than their own, we have to declare war on all Muslims. As in WW One and Two the enemies nationals were interred so we must interred all Muslims in Western Countries and leave them interred or return them to their religious capital in Mecca. If right minded Muslims then wished to change their governing bodies then they would have the opportunity of altering these regimes and declaring a truce. The British people should not have to bear the expense of feeding and caring for the Suicide Bombers whose admitted intention was to kill as many innocents as possible. Maybe, they should not be fed and the Muslim community should be asked to publicly donate food for there substance of course once this donation has been made, when the donate/supporter has been identified then they can join there like minded religious brothers in the prison without food for the long hungry last sleep before they meet there god. When you have run out of Muslim Suicide supporters, you run out of Muslim suicidal bombers. Its not really capital punishment, its just a method of helping them get to Allah without taking any innocents with them. Instead of inconveniencing airline passengers and threatening the rest of the human race. Maybe not so effective as burying them all in pigskins but some general action to remedy the actual problem is required instead, of imposing more regulations on firearms and reloading components which is what they will more than likely do.